Creekside Chiropractic Center is located in the heart of Olde Gahanna at 136 Mill Street, Suite 120 across from the City of Gahanna Parking Garage. The creekside area of Gahanna is located just off 270 and the route 62 exit, Gahanna. Parking is found in the front of Creekside Office Center, as well as, off of the alley to the side and back of the building. 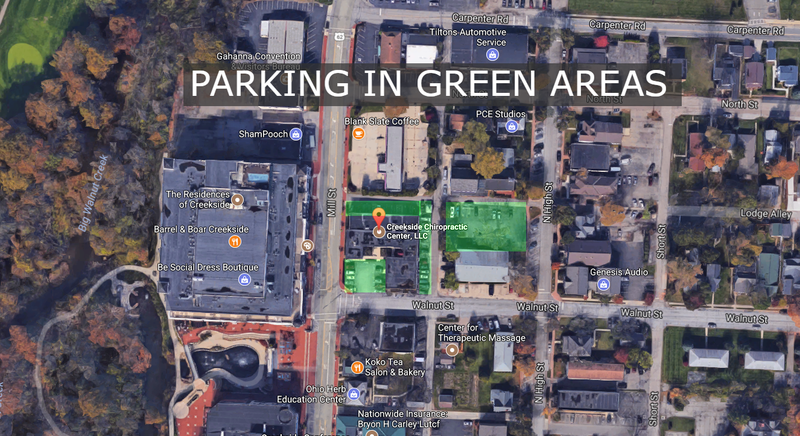 Parking for Creekside Chiropractic Center is located in front of the building off of Walnut Street as well as behind the building in the alleys off of Mill Street and Walnut Street. Creekside Chiropractic Center is located in the heart of Olde Gahanna at 136 Mill Street, Suite 120 across the street from the City of Gahanna Parking Garage. The Creekside area of Gahanna is located off I-270 and the Route 62 exit, Gahanna. Parking is in the front of Creekside Office Center, as well as off of the alley to the side and back of the building. 2017 © Creekside Chiropractic Center. | All rights reserved.